we do not take reservations - just come on in! 6/2-6/3 - BUXTON HALL WELCOMES D.C.’S BAD SAINT FOR A TWO-NIGHT POP-UP IN ASHEVILLE. 10/15 - PRESERVATION DINNER WITH EMILY CADMUS. Click here for tickets. 9/24 - Elliott moss at euphoria greenville's Sunday Brunch: Fired Up! Check out OUR FIRST COOKBOOK, BUXTON HALL BARBECUE'S BOOK OF SMOKE! to get your very own signed copy (not available anywhere else), JUST CLICK HERE. LEARN THE STORY OF BUXTON HALL AND LEARN THE RECIPES OF OUR FAVORITE DISHES. 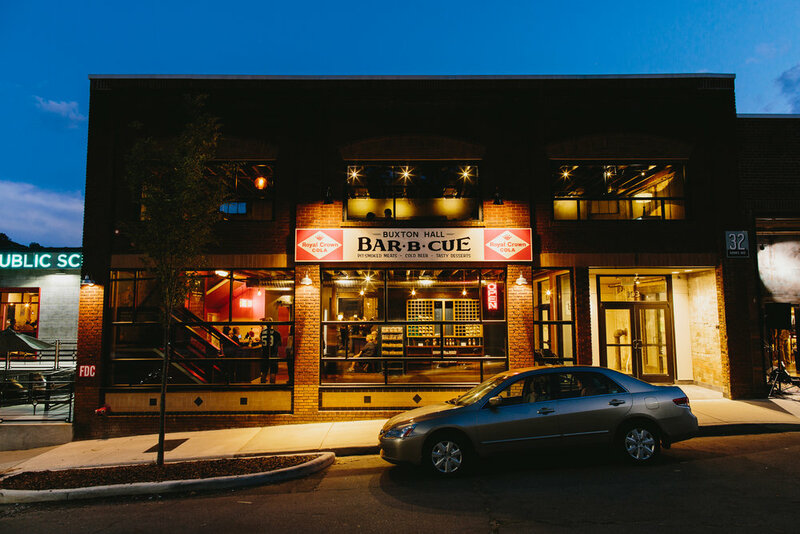 IT'S ALL IN HERE: SMOKY FRIED CATFISH, SLOW-COOKED COLLARDS, SMOKY PIMENTO CHEESE, OUR FAMOUS FRIED CHICKEN SANDWICH, PASTRIES AND PIES, WHOLE HOG BARBECUE, AND A LOT MORE FROM PITMASTER ELLIOTT MOSS AND THE BUXTON TEAM.